After considerable efforts for generating an international ban of the anti-personal mines [AP, "landmines"], culminating in the "Mine Ban Treaty" of 1997 and the Nobel prize for the International Campaign to Band the Landmines and its president, Judy Williams,. a certain saturation in the public attention of this problem can be felt. Thereby, AP remains the very dominating problem in those regions which are infested with them. Only small parts have actually been cleaned and the biggest nations and mine-producers (USA, Russia, China, India and Pakistan) have still not agreed to sign the ban. Even among those nations who have, damage-relief contributes a ridiculous small part of what was previously invested in research for producing more destructive AP. Ironically, some mine-producing firms have now "converted" to producers of mine-cleansing devices. 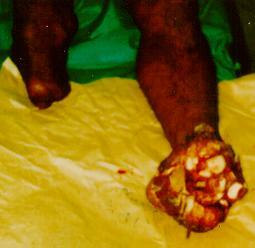 <ul=type circle specific disease, specific abnormal physiological state, specific abnormal psychological state, specific and permanent diasbility or specific disfigurement; field mortality of more than 25% or hospital mortality of more than 5%; grade 3 wounds as measured by the Red Cross wound classification; or effects for which there is no well recognized and proven treatment. From: Coupland RM and the SIrUS Project Group. Towards a determination of which weapons cause "superfluous injury or unneccessary suffering". Publication of the ICRC, Genéve 1997, 44 pp. The SIrUS project has been endorsed by many societies, including the Association of Anaesthetists of Great Britain and Ireland and the World Academy of Disaster and Emergency Medicine, both in 1999. Conversely, it is difficult to understand why many societies of surgery, anaesthesia and emergency medicine have failed to endorse this project, thus helping to influence public opinion. This is probably not resulting from bad will but is an indication of the vaining interest in the problem. It is a mistake to believe that it has lost any importance in the countries suffering from AP which, in spite of all resolutions, arepatiently waiting for somebody to step upon them. More AP are still produced than removed and economical considerations are the reason for some mineproducers not to enter the ban. Moreover, some of the bombs dropped over Serbia in 1999 fulfilled the qualities of SIrUS, e.g., grenades exploding only after being touched at the ground (similar to AP). Such evil developments underline the need for a broad public ban of weapons causing SIrUS. Fig. 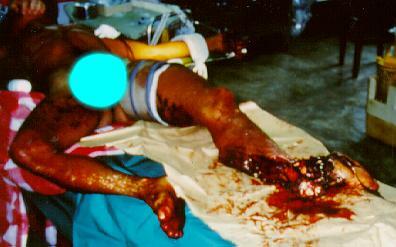 2: Young Cambodian man with amputation injury of the left foot. Healed amputation of the right leg bears wittness that this was not his first meeting with a landmine (Photo: Dr. Hans Boie, Denmark, made at an ICRC hospital in Cambodia). So, the mines are mostly still there where they were when a more intense public opinion could be traced. Even if it should prove possible to block further distribution, a large-scale removal needs to be carried out. To a considerable part, this is a possible task-but where is the will (and the money) to do so? Mercantile aspects are used to block competers from getting a prosperous "cleasning task," although this does not guarantee bringing anybody else into business. As a result, it would be good if you - personally - would consider what you could do against the evolving apathy. Perhaps in spreading the message to other individuals, perhaps by influencing some organization or society in which you are a member. Fig. 3: Cambodian boy with serious amputation injury of the left foot (Photo: Dr. Hans Boie, Denmark). In the American-English-Iraqi War 1993, a large number of so­called “cluster-bombs” were utilized by the allied forces. These shells explode with a distribution of fragments over as much as 2,400 m2, and they can hardly be regarded a military weapon, as most of its victims are civilians. Moreover, the cluster-bombs have a high failure rate of up to 50% and they are easily confused with the packets for emergency food supply (of the same colour). Thus, unexploded munition waits for civilian victims (predominantly children) to enter their trap. Moreover, other malicies are threatening Iraqui civilians. Since the first Iraqui war in 1991, a large number of uranium-enriched shells were utilized for the purpose of increasing their penetration. Similar shells were distributed over Serbia, including Kosovo (but to a lesser degree in order not to affect later occupation). The radioactivity of these shells is low and claimed not to be associated with any symptoms of disease by the American armed forces. The terribly high incidence of leukaemia in Iraq may be an indication, that this claim is not true. An epidemiological investigation (also advocated for Serbia) has not yet been carried out, and there are good reasons to fear that the occupying forces do not want this problem to be publicly known for as long as possible. How many uranium-enriched shells were utilized during the last war remains obscure. Towards the end of their lawless aggression towards Lebanon in July-August 2006, the Israeli army distributed ~2 million clusterbomblets in South Lebanon, the majority within the last two days as was already clear that there should be an armistice. It is estimated that 40% did not instantly explode. The IDF also admitted to having used chemical warfare with white phosphour (as used by the Americans in Falludja 2004) but claimed that also this was no war crime. What is it, then? A study, which was financed by the Norwegian government in 2006 - the first to document the impact of cluster munitions on people in all 24 countries and regions known to be affected by these weapons - showed that 98% of cluster bomb victims are civilians. The International Red Cross started a campaign for prohibiting the cluster-bombs, an initiative 18 civilized countries immediately supported (but unfortunately not the warrier nations).